The discovery of tobacco in the New World in the sixteenth century and the opening of a worldwide market created the need for a portable way to make fire. Pieces of flint and steel struck against each other and modified pistols were early devices. In 1903, Austrian chemist Carl Auer von Welsbach made a hand-held lighter with a striking wheel. During World War I, soldiers made their own using empty cartridges. In New York City in 1886, Louis V. Aronson opened a company for "artistic metal wares" for smokers and patented an automatic lighter after World War I. In 1931, George G. Blaisdell of Bradford, Pennsylvania, saw a friend trying to light his cigarette with an awkward lighter, but one that worked. Blaisdell acquired the American distribution rights for the Austrian product. He redesigned the case for comfort, improved the chimney (or wind hood) around the wick to make the lighter windproof, and modified the fuel chamber. Blaisdell named his lighter "Zippo" because he liked the sound of the word "zipper," which was another new and publicly acclaimed device. He began manufacturing his lighter in 1933. Blaisdell's timing was poor and the lingering Great Depression nearly bankrupted the company. His luck changed during World War II, when soldiers found that Zippo lighters worked in all weather conditions. Crews of Navy ships have used these lighters with their own logos since World War II, and custom lighters for soldiers have been distributed during every war through Desert Storm. The lighters had may uses in wartime; GIs heated powdered rations in their helmets with the lighters and were able to start fires in all types of weather. Collectors seek out Zippo lighters primarily because of the commemoration of large and small events on their cases. Advertisements from the 1940s and 1950s are valuable collectibles, as are lighters marking the 1969 moon landing, sports teams, many corporate clients, and a range of other historic events, personalities, and special interests. In 1997, 9,000 different images were used on the lighters. Today, Zippo is the only manufacturer of pocket lighters in the United States and produces 50,000 lighters a day. Other production has shifted to Europe and Asia where smoking is more popular. Other large manufacturers of pocket lighters, like Ronson and BIC, have facilities in Austria, France, and Asia. BIC's contributions to the lighter are a childproof metal shield over the spark wheel and disposable, mini-sized lighters. BIC, Scripto, and others also make utility (fireplace) lighters with long tube shapes that are fueled with butane gas. Other firms make cigar lighters. 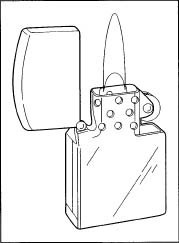 The entire bottom case and the parts of a lighter are called the outer case assembly, and the inside case (containing the fuel and sparking action) and its parts is called the inner case assembly. The raw materials used for lighter manufacture are mostly metals. The outer case is made of cartridge brass, a material that was developed for rifle cartridges. A specialized mill makes brass sheets of the proper thickness and cuts them to the width required by the lighter manufacturer. The brass is wound on large rolls or spools that are delivered to the factory. A metal mill processes stainless steel for the inside case in a similar manner. It also arrives on large spools, and each holds enough metal to produce several thousand lighters. The manufacturer produces the majority of the parts in a lighter. Most of the smaller parts are also made of brass or steel, depending on the purpose and location of the part in the lighter. The flint tube and spring tip (contained in the fuel chamber) are brass, as is the screw that holds these in place and exits the bottoms of both cases. Other small parts inside and connected to the inner case are stainless steel. The cam, cam rivet, and plate are attached to the back top of the inner case and hold the lighter closed. In the chimney (wind hood) area and on the front, the cam spring and eyelet and the rivet for the flint wheel hold the fire-making parts. Specialized contractors make the eyelets and fasteners. Three non-metallic components are also parts of the inner case assembly; these are wicking, balls made of a cotton-type substance, and felt. The wick and balls are placed in the fuel chamber. A piece of felt is fixed to the bottom of the inner case, but its front end can be lifted to allow lighter fluid refills and new flints. Other metals, including nickel, chromium, and gold, are used to plate the brass cases upon customer request. Nonmetallic conducting fluids are used in the electroplating baths for the cases. Many methods are used to add decorations to the right faces of the lighters: three-dimensional (relief) emblems typically representing organizations can be attached to the lighters, designs can be etched or engraved in the metal, and lasers can draw detailed designs that are colored by any of several methods. Epoxies and special inks and powders are needed for these images. The basic design and operation of the pocket lighter have changed little since the 1930s, but the use of new technology has drastically altered many aspects of production. In manufacturing, "design" includes not only the product and its parts but also the introduction to and interaction of machines with assembly and other production processes. One new machine or technique may require others. Consumer interest has also changed. Lighters were once essential pocket tools, but are now often prized as "pocket art." Sophisticated techniques such as laser engraving and technigraphic printing are some of the means of dressing lighter cases. These require skilled artists and engineering expertise in artistic and production considerations, as well as time and cost limitations. The manufacturing process begins at the factory's receiving dock, where raw materials and parts from suppliers are received. Plant personnel check the quantity and quality of materials and components. They also review blueprints and specifications to confirm that materials and parts meet the design engineer's requirements. The coils of metal used for the outer and inner cases are rolled through presses in a process called "deep drawing." The presses punch in the edges of each lighter (as if it were unfolded and flattened) as well as key details. The holes in the lighter chimney are punched all the way through the steel of the inside case. The manufacturer's name and date codes are pressed into the bottoms of the brass outer cases. The case pieces are trimmed. They are moved to the fabrication area where machines bend and fold them into their boxlike shapes, and are then spot-welded together. The welding machines are highly accurate and can spot-weld a number of different positions in a case at the same time. Meanwhile, small metal parts are moved to assembly stations in preparation for receiving complete cases. The lighter manufacturer fabricates most of the specialized parts, including the case hinge and the brass parts that hold and push up the flint. A precision machine fabricates and welds the hinges connecting the case lid and bottom to both parts using a strong welding process called "resistance welding." Other fabrication machines produce the components of the flint tube. The brass finishes of the outer cases may remain unplated, but often the exteriors are finished in other metals, including nickel, gold, and chromium. This is done in a process called electroplating, in which a small electrical charge is applied to lighters suspended on a moving row of hangers that pass through a liquid bath. This bath contains a conducting solution that is non-metallic as well as a small piece of the plating metal. The opposite charge is applied to the bath, and atoms of the plating metal are drawn from that metal piece to the charged lighters. In this coating process, a thin layer of atoms is electrically bonded to all the surfaces of the cases. Regardless of metal type, all cases receive final finishes. Many are polished to a sparkling luster. Others are given a brushed look or a texture. Assembly line workers apply the final finishes, inspect the lighter cases, and put them in fitted boxes for transfer to the next assembly station. Machined parts are then fixed to the top of the inner case assembly. The cam, a finger-like projection from the inner case, applies enough pressure on the lid of the outer case to keep it closed. When the owner pushes up the front of the lid to operate the lighter, the thumb pressure overcomes the pressure that the cam applies, and the lid pops open easily. The cam plate, which supports the cam, is riveted into place, and the cam is also fastened to the case with a rivet. Holes for these rivets were punched in the case when it was first deep-drawn from the stainless steel strip. A cam spring is added to the base of the chimney, which is also the top of the box-like portion of the case. An eyelet screw through the cam spring fastens it down and also provides the opening for the wick. Elements of the inner case assembly are inserted in the welded shell. Several small balls of cotton-type material are placed inside the fuel chamber that will contain the lighter fluid. A length of wicking is inserted and will be pulled through the eyelet in the chimney later. The internal components of a Zippo lighter. spark and light the fuel, must also be firmly fixed to the top of the inner case assembly. A machine rivets the flint wheel to the case. Connections for the wheel on the lighter were also pre-punched during deep drawing. Fints for producing the spark must be held in position next to the flint wheel and raised as they become worn. A brass tube is inserted in a hole in the bottom of the inner case. 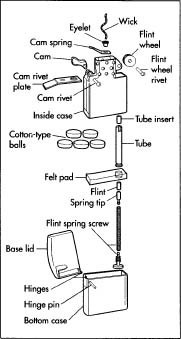 A flint, a spring tip that is directly in contact with the base of the flint, and the flint spring are pushed through the brass tube. The spring tip is made of brass, but the flint spring is hard spring steel that withstands wear. A felt pad with a pre-cut hole for the flint and lighter fluid is stamped on the bottom of the inner case. The wicking is pulled through its eyelet, and the inner case assembly is installed in the outer case assembly. sides (as the lighter openings face forward). Diamond-drag rotary engraving cuts geometric patterns or monograms into some cases. Two types of lasers are used to engrave the outlines of line drawings, photos, company logos, and other designs on the sides of lighters. Still others have designs etched in them with computer-controlled etching machines. Many designs can be filled with color using a painting method. To color more elaborate designs, a sublimation process transfers color by heat and pressure directly into the surface coating. In an example of this technigraphic method, a presentation box displays a design that extends over multiple lighters. A jungle scene that covers four lighters may have designs of animals and plants that stand alone on a single lighter, but may also form a puzzle or mural across the set. The art department also designs packaging for maximum marketing effect. The artwork on the packages changes with the product and with customer orders. The boxes also showcase their contents. Plastic boxes, blister-card plastic containers, deluxe wood boxes, and custom-made collector tins with exterior designs that complement the enclosed lighters are examples. These may also have custom wrappings and may be lined with velour, felt, or other fabrics. Quality control is subject to the same engineering detail as any of the plant operations. A quality method called Statistical Process Control (SPC) builds controls into all design aspects, from product conception to management. Lighters may not seem like highly sophisticated products, but their manufacture requires advanced technology and equipment to be cost-competitive in today's market. Programmable logic controls (PLCs) allow machines to operate using information from an extensive database. Data acquisition is readily available plant-wide. Man-machine interfaces (MMIs) correct problems as they happen, and lighters with even the tiniest flaws are pulled from production immediately. These interfaces also keep all machines operating so that the maintenance or repair of one does not shut down others. Mechanical quality is maintained by seeking the best new technologies, including fabrication processes and robotics. Finally, the personal touch cannot be replaced. Assemblers are responsible for monitoring the product in their area and for alerting supervisors if details are not perfect. The processes required for lighter manufacture have been vastly improved to limit waste. Solvents were used in the past to degrease machine parts, but today's operations use only soap and water. Fewer hydrocarbons are used in deep drawing metals, and some plants have a complete water treatment system that returns creek water to the environment in a cleaner-than-natural state. Lubricants are used as mists to penetrate the fine workings of screw machines, but the mist is fully contained to protect the ozone layer and employees. Fabric dust is vacuumed and contained, and metal and paper wastes are recycled. Lighter makers have largely fled the United States for Europe and Asia where smoking is more accepted. However, lighters still have a promising future. They are handy as small light sources for finding lost keys and keyholes in the dark, and their wind resistance helps users determine wind direction because high winds or poor weather will not extinguish the flames. Metal, reusable lighters are competitive against disposables because of their durability, reliability, quality, and sentimental value. Quality lighters are considered luxury items, however, and the competition for consumer dollars in this area is high. Lighter makers add artwork for uniqueness and adapt the outer cases to other personal accessories with the same convenience and quality. Schneider, Stuart, and David Poore. Zippo: The Great American Lighter. Atglen, PA: Schiffer Publishing Ltd., 2000. Schneider, Stuart, and Ira Pilossof. The Handbook of Vintage Cigarette Lighters. Atglen, PA: Schiffer Publishing Ltd., 1999. Dininny, Paulette. "Keepers of the Flame: After Big Sales in World War II and Parts in Old Movies, Zippos are Still Around, Often as Hot Collector's Items." Smithsonian Magazine (December 1998). BIC Corporation Web Page. December 2001. < http://www.bicworldusa.com >. International Vintage Lighters Exchange Web Page. December 2001. < http://www.vintagelighters.com >. "Lighter." Discoveries and Inventions Web Page. December 20001. < http://www.quido.cz/objevy/zapalovac.a.htm >. Zippo Web Page. December 2001. < http://www.zippolighter.com >. This article needs updating. Bic does have manufacturing in the U.S. They also have a manufacturing facility in Brazil. That is according to Bic video on youtube called "2013 BIC lighters manufacturing". And if you look at the packaging of Bic lighters in the U.S., you'll see that some are marked Made in France and some are marked Made in the U.S.